URBANA, Ill. – Nematodes may be among the simplest animals, but scientists can’t get enough of the microscopic roundworms. They have mapped the entire genome of C. elegans, the “lab rat” of nematodes, and have characterized nearly every aspect of its biology, with a particular focus on neurons. For years, it was assumed other nematodes’ neurons were similar to those of C. elegans, until researchers at the University of Illinois demonstrated the vast diversity in neuronal anatomy present across species. The gonads in all nematodes develop within a structure called the gonad arm, a tube through which multiple reproductive organs migrate into place throughout the animal’s postembryonic development. 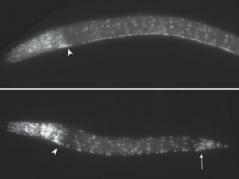 This happens in a highly predictable manner in C. elegans, with very low variability among individuals. Not so with Steinernema. That’s when the nematode starts feeding on the insect and the bacteria that, by this point, has spread throughout the insect’s body. Being exposed to this external bacterial stew is what triggers the nematode to begin its postembryonic sexual development and then to reproduce with other nematodes nestled inside the same insect. As one can imagine, it could be rather difficult to replicate that environment in the lab. “Bui was able to trick them. He put them in a high density of this bacteria, and essentially tricked them into coming out of this juvenile stage to undergo normal reproductive development without being inside the insect,” Schroeder says. The article, “Postembryonic ventral nerve cord development and gonad migration in Stinernema carpocapsae,” is published in the Journal of Nematology [DOI: 10.21307/jofnem-2018-005]. Hung Xuan Bui and Nathan Schroeder are affiliated with the Department of Crop Sciences in the College of Agricultural, Consumer and Environmental Sciences at U of I. Bui is also affiliated with the International Rice Research Institute in the Philippines and Can Tho University in Vietnam. The research was supported by the Lee Foundation Fellowship program.